Photo by Cho Sung-Bong/ The 14th caisson. Despite the Island governor’s demand to the navy on Oct. 30 to stop the input of caisson on the sea until the finish of simulation on 150,000 ton cruise, the navy thoroughly ignores that. 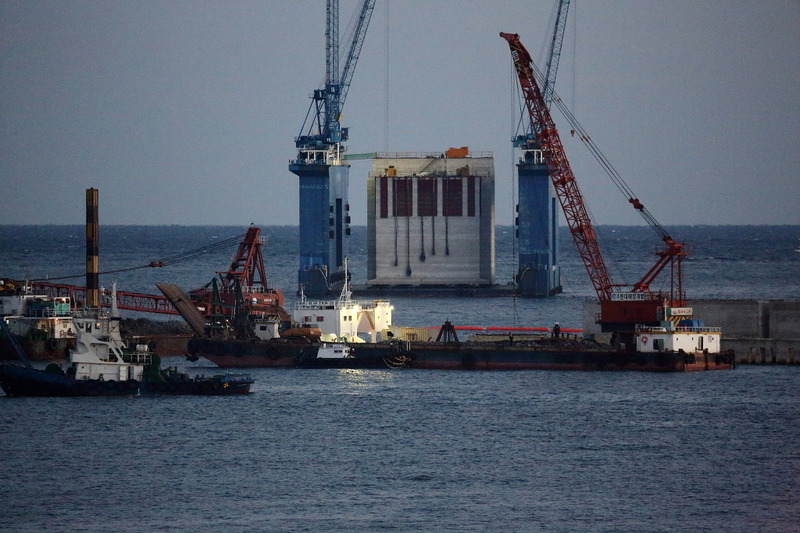 The navy-contracted company, Samsung C & T moved the 14th 8,800 ton caisson from the Hwasoon port to Gangjeong sea on Nov. 15. See more photos by Cho, here. During both days of Nov. 16 and 17, issues regarding the budget on the Jeju navy base project were hot, especially with the Island governor’s request to the visiting Democratic United Party members to pass the budget on subsidiary condition. The villagers criticized on it with statement (see its translation on No.3). This article is a summary of four subjects during both days. 1. Even no discussion: National Assembly discussion on budget was postponed again because of gap between the parties. 4. Suspicion on the navy’s enforcement of breakwater construction before simulation is raised. The National Defense committee of the ROK National Assembly had the plan to hold the 3rd Budget and Balance sub-committee meeting in the morning of Nov. 16. It was to talk on the direction on the disposal on the 200.966 billion won budget for the Jeju naval base project, 2013. However the committee could not even discuss on it. The Budget and Balance sub-committee has had the meetings on Nov. 7 to 8 and Nov. 12 but those have been with no result as the parties could only confirm different positions between them. The National Defense Committee plans to have its general meeting on Nov. 19, Monday, and will try to reach to an agreement. If it is without result again, it will consider on opening the Budget and Balance sub-committee again. In the Nov. 19 meeting, talks on the Jeju naval base and inspection on K2 tank will be talked. The biggest reason that the disposal on the Jeju naval base budget has met difficulty is because of big gap between the ruling and opposition parties. The ruling Saenuri Party (New Frontier party) is insisting its position to pass the budget as the original proposal by the Defense Acquision Program Administration (DAPA). However the Democratic United Party (DP, afterward), the main opposition party has different opinions of whole cut, part cut and conditional pass within the party. The National Assembly has cut 96% (127.8 billion won) of 132.7 billion budget last year. However, unused budget of about 107 billion won in 2011 was transferred to 2012 with law-evasive way. How you can help? Please pressure as seen in No. 2 of here. The pressure works. The groups including the Gangjeong Village Association, Pan-Island and National Organizing Committees to stop the Jeju naval base, criticized that the Prime Minister Office’s acceptance of simulation is merely to pass the budget on the naval base project. “However, the limitations in the conditions of simulation that the Jeju Island government and Office of Prime Minister agree with each other are too clear to clarify on the citizens’ suspicions on the safety of the navigation by 150,000 ton cruises . The Jeju Island government has asked simulations on five types but the Office reduced them into two because the Office hard pressured the Island government to concede it. 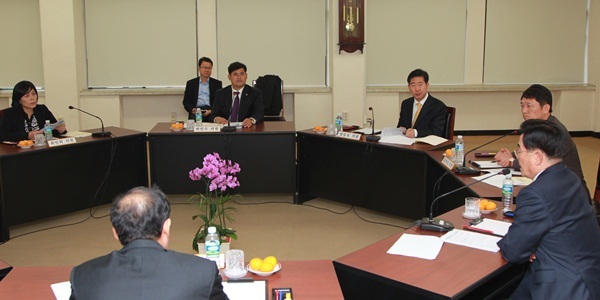 On July 18, 2012, the Jeju-based or origin four National Assembly members of Kang Chang-Il, Kim U-Nam, and Jan Hana (All DP) have raised an issue that the 2nd simulation on the control of ships, which should be based on observing regulations, has not been properly carried out. The four members pointed out that there are serious flaws in the 2nd simulation and demanded the Government and navy temporary stop of construction and observance on the National Assembly subsidiary opinion in 2011. In October, 2011, the sub-investigation committee on the Jeju naval base project that belonged to the Budget and Balance Committee of the National Assembly recommended to the Government to “verify on the matter of free entry/exit of port for two 150,000 cruises through the specialized 3rd institute in need. However, the Ministry of National Defense unilaterally carried out simulation and made public the 2nd report in February 23, 2012. Otherwise, the Ministry of Land, Transportation and Maritime Affairs submitted its opinion statement to the four members around July that it is desirable to carry on simulation again because there is a great risk of danger by occurrence of accident, with the low variables given in the 2nd simulation scenario. Four members of the Democratic United Party, belong to the Budget and Balance Committee of the National Assembly visited Woo Keun-Min, Island governor in the afternoon of Nov. 16. The four members are Park Min-Soo, Yang Seung-Jo, Choi Min-Hee and Choi Jae-Sung. The total number of the members in the Budget and Balance Committee is 51. Among them, 21 belong to the DP. Hearing the governor, the four members promised to the governor that they would actively support for the proposed items by the Jeju Island governor in the National Assembly. However, it is still uncertain for the DP as the party has taken construction stop and re-examination of project as the party opinion since April 11 general election, despite its recent being stirred regarding budget. Source: Jeju Sori, Nov. 16, 2012. Governor Woo (right in the photo) asked four visiting members of DP belong to the Budget and Balance Committee of the National Assembly to pass the budget on naval base on Nov. 16, 2012. Why does Island governor, Woo Keun-Min represent the interest of navy? Island Governor Woo has finally revealed his hidden intention. While he has shown his shifting attitude many times such as in the hearing on the navy in May when he was even seem to consider to make order the navy to stop construction, [on Nov. 16] he requested to [the visiting four DP members] to pass the budget [on the Jeju naval base project] with subsidiary conditions as the budget got brake in the National Assembly. It has been clearly turned out that the Jeju naval base is a project that would make the Jeju Island to be militarized with the posturing cover of civilian-military complex. The proof is that it is conditioned that ships’ entry and exit of port is only possible under the permission of jurisdiction unit commander in the revision on the enforcement order on Protection of Military Bases and Installations Act. It has also been exposed that the CNFK (Commander of US Navy Forces of Korea) has demanded the layout possible for nuclear aircraft carrier to come alongside the pier and it has been accepted in building of it. Through exposed meeting minutes by the technical verification committee under the Minister of Prime Office, we could also confirm the will of the Government who is to drive the project without base design change. The Prime Minister office accepted the joint simulation show to merely pass the naval base budget next year in its hidden intention. It is the calculation of timing that it is to that extent only once the National Assembly passes budget biting the [government acceptance] of simulation verification that could be done only next year. Combining all those situations. it is clear that the ROK Government neither concerns with the interest of the Jeju Island nor the public sentiment of the Island people. It is mad only to drive for military base project, hammering away to ignore even the position of the Jeju Island that is stepping toward international tourism site and whose role of bridge in the international civilian diplomacy is being promoted. In such situation, governor Woo demanded to the National Assembly to pass the 2013 Jeju naval base budget when the Office of Prime Minister agreed with re-revelation on simulation, which is not re-verification. Even though he says he conditioned that the budget should be executed under proper verification, there is no reason that Island governor demand to pass the budget since the budget that might be passed by then purely comes from the Ministry of National Defense, not from the Ministry of Land, Transportation and Maritime Affairs. Why does governor Woo demand the budget from the Ministry of National Defense? Is he entirely forgetting that he is the governor of the Jeju Special Self-Governing Island? Is he naively expecting that the navy would step for proper verification if it is allocated with budget? Why is he requesting to pass the budget in prior to a proper simulation while the navy could be re- allocated with special budget after it as it wants? Finally it was proved out that the Island governor Woo Keun-Min has no concern with whether the Jeju naval base would be a proper civilian-military complex port for Tour Beauty or not; and whether the Island people would get any damage from it or not. We don’t need Island governor who takes the lead as the representative of the navy and save only the interest of Samsung and Daelim. On Nov. 7, 2011, the sub-investigation committee on the Jeju naval base project under the Budget and Balance Committee of the National Assembly stipulated two recommendation items when they adopted its activity report. The first was the recommendation to revise the enforcement decree on the Port Act and Enforcement Decree on Protection of Military Bases and Installations Act and to conclude on the protocol on the joint use on the civilian-military harbor and bay, so that there should be no worry that the Jeju naval base would be operated centered on military port. The revision on the decree has been carried out on June 29 while the talks on the conclusion on the protocol is still being processed and there remains the matter of simulation verification. The Jeju Island expects the simulation period at the end of December or January, next year. On May 1, 2012, even Park Geun-Hye, the daughter of military dictatorship and Presidential runner of the ruling conservative Saenuri Paty said that simulation verification has to be prior to construction on break water. See the Korean article on it here. However, the village has raised suspicion on Nov. 17 that the construction being done in the Metboori coast(in the east tip of the naval base project area) could be breakwater construction. Source: Jeju Sori, Nov. 17, 2012 (Original source: Gangjeong Village Association)/ Construction in the Metboori coast (east tip of the project area). In the map, the spot is marked with red color, planned to be the east breakwater shore protection. The current construction on the spot raises a suspicion that the navy is enforcing construction on breakwater by reclaiming land from the sea before simulation verification. For more photos by Cho Sung-Bong, see here. The east part is also for docks for submarines and small ships. “The biggest problem is that substantial breakwater construction is being done. Given the photo (above), it is the area spot being reclaimed from the Metboori coast to the sea, along the silt protectors. This area belongs to the east breakwater shore protection ( * in charge of Daelim) and outer facilities on the base layout map.” See the construction map here. “ not only that, the navy is processing the substantial construction on the west and south breakwaters, too, by stationing caissons. By when will the Island government on-look companies’ such law-evasive construction. 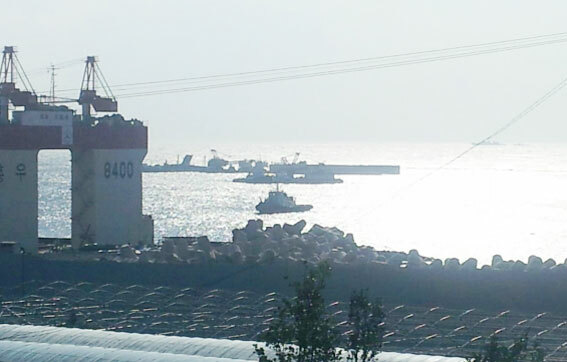 Source: Headline Jeju, Nov. 17, 2012/ Working ships to station caissons to build west breakwater. 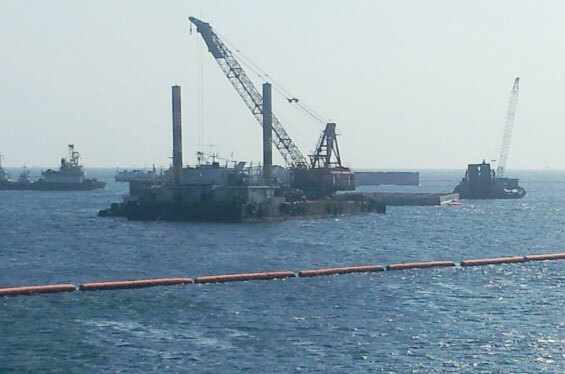 Source: Headline Jeju, Nov. 17, 2012/ Working ships to station caissons to build southbreakwater. 내년 제주해군기지 예산, ‘부대의견’ 달아 승인?